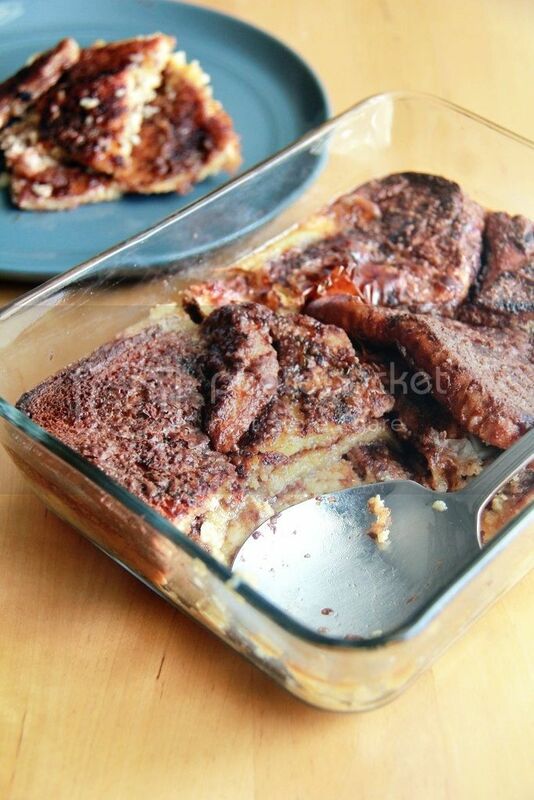 Crumbs and Cookies: nutella french toast pudding. The history of hybrid desserts often goes something like this: If chocolate chip cookies and brownies/pancakes and french toast/doughnuts and croissants are already so good on their own, won't combining them result in double the deliciousness? Personally I don't believe in the equation that fusing one awesome dessert with another creates something that is twice as delicious as its components. Most times the result often suffers from excessive sugar or butter (think the cronut) and can seem just horribly unnecessary when taken to extremes, although I have to admit that the process of making those desserts is very exhilarating and liberating. You stop being a baker and more of a mad scientist let loose in the kitchen; the usual chains of precision and exactitude wrap around your wrists a lot less tightly than usual. Sometimes hybrid desserts emerge as successful experiments, sometimes it's hard to decide if you should slap a label marked "fail" on them - they are not exactly such a wreck that you would abort the idea forever; with a bit of tweaking they could actually work out, but then they cease to exist as a hybrid dessert and transform back into one that already exists. 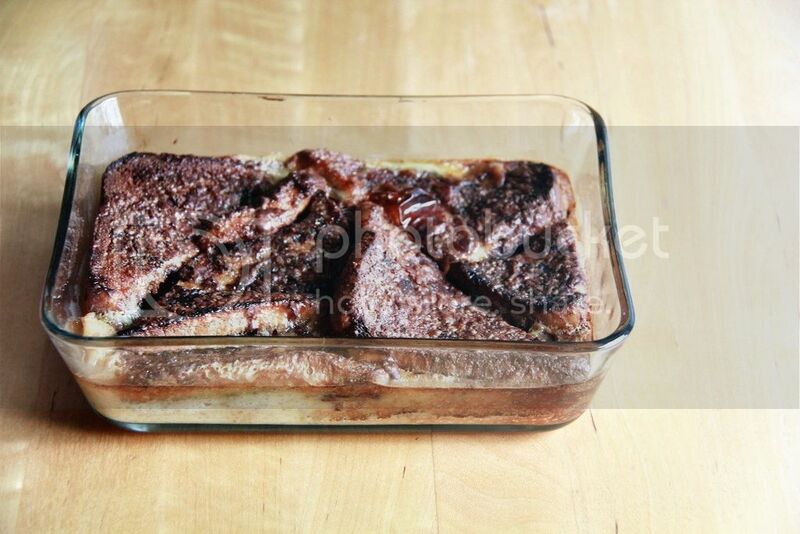 As much as I hate to admit it, this nutella french toast pudding sadly belongs to the latter category. I have many issues with this idea (none of which is the nutella of course) but my main grouse is the shape of the french toasts. I mean, triangular toasts are very cute and all but I don't feel that their shape is suitable for a pudding. When you cut into the french toast pudding with a serving spoon the layers of french toast will start to slide and ruin the appearance of whatever that is left in the baking pan. Don't expect the serving of pudding that you've dished up for yourself to look neat either. It's rather challenging to eat the pudding with a spoon or a fork - one utensil basically - because you have to deal with large pieces of bread. Medium-sized cubes, on the other hand, would seem like the ideal shape that the bread would have to be to facilitate an enjoyable eating experience, yes? Here comes the contradiction. By converting the french toast into cubes they lose their signature sort of look and won't really strike you as french toast. And frankly whether you use french toast or not there probably wouldn't be much of a difference in taste in the final product so you could just go with a regular bread pudding recipe. 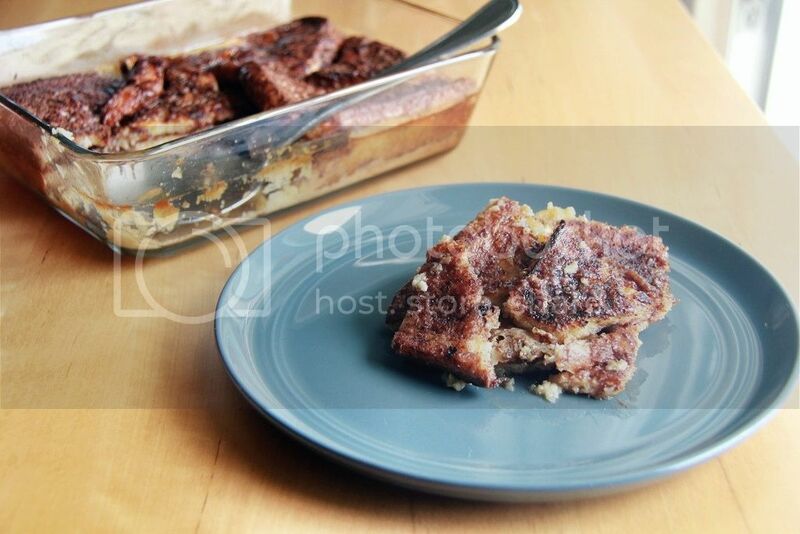 By the way, this nutella french toast pudding is actually inspired by Dorie Greenspan's coupetade recipe, which is a french toast pudding with dried fruits. I was just curious about the idea of french toast in pudding form and I didn't have any dried fruits on hand so I did away with them. I wasn't planning on including nutella at first but when I saw how plain the french toasts were my hand instinctively twitched towards the nutella jar. What, you thought that I would obediently follow a recipe to a T? My comments about this recipe may seem rather negative but I think it's a decent pudding overall, just that the french toast bit is rather redundant. I understand that the idea of a french toast pudding is rather appealing though so I think it's best that you try out the recipe and see for yourself if the french toast step is worth the effort. Generously butter a 9 x 13 inch baking pan. Have a roasting pan at hand that's large enough to hold the baking pan and line a plate with a double thickness of paper towels. Make the french toast: Whisk the eggs, sugar and milk together until well blended. Put a large skillet over medium heat and toss in 2 tbsp of the butter. While it's melting, soak 2 or 3 slices of bread in the egg mixture (how many you can soak at a time will depend on how many slices you can fit in your skillet), making sure that each side gets a soak. When the butter bubbles have subsided, add the bread to the pan, and put more slices into the bowl to soak. Cook the bread for 2 to 3 minutes on each side or until both sides are golden and crusty. Transfer to the paper towel lined plate and continue soaking and sautéing the pieces of bread, adding more butter to the skillet as needed until you've cooked the lot. Spread the nutella evenly on the french toasts and cut the slices of bread in half on the diagonal so you have 16 triangles and arrange them in the baking pan. Don't worry about being even, just tuck the slices in as best you can. Center a rack in the oven and preheat the oven to 325F. Make the custard: Whisk together the eggs and sugar in a bowl until foamy. Beat in the vanilla, then whisk in the milk until the mixture is smooth. Place the baking pan in the roasting pan and slowly pour the custard over the bread. Allow the pudding to stand for 10 minutes to give the custard a little time to start soaking into the bread. Pour enough hot water into the roaster to come about halfway up the sides of the baking pan and very, very carefully slide the setup into the oven. Bake the coupetade for 1 1/2 to 1 3/4 hours, or until the custard is set - a knife inserted into the custard will come out clean. Transfer the baking pan to a rack and allow the pudding to come to room temperature. I prefer the pudding warm but you can serve it chilled too. 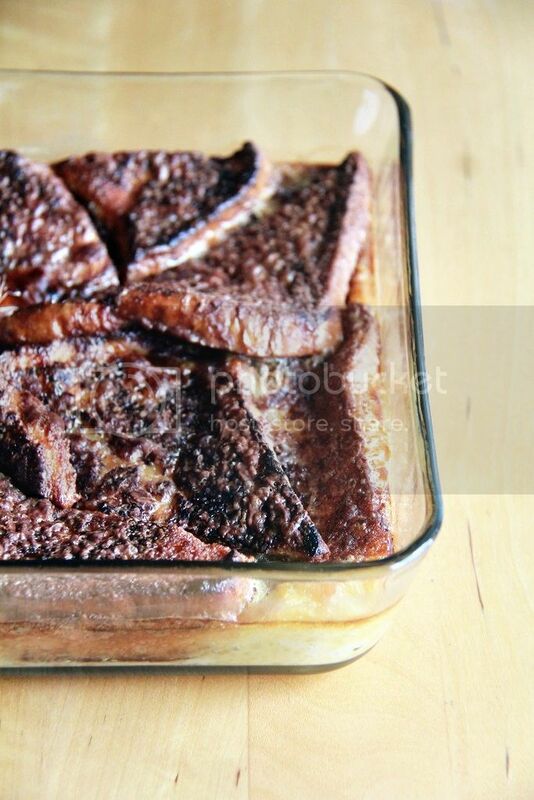 My mouth is watering, your Nutella French Toast Pudding looks and sounds wonderful. Thank you for sharing with the Clever Chicks Blog Hop! I hope you’ll join us again next week! michael rostang's double chocolate mousse cake.